^ Rashbaum, William. 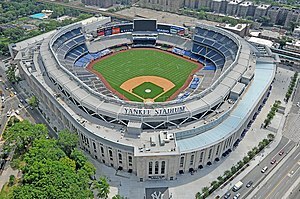 Cracks Emerge in Ramps at New Yankee Stadium. New York Times. [19 November 2014]. ^ New York Yankees on the Forbes MLB Team Valuations List. Forbes. April 11, 2017 [April 11, 2017]. ^ Kronheim, David P. 2015 MLB Attendance Analysis (PDF). Flushing, NY: Number Tamer: 11, 165. 2016 [February 18, 2017]. ^ New York Yankees on the Forbes MLB Team Valuations List. Forbes. March 25, 2015 [April 11, 2016]. （原始内容存档于June 4, 2015）. ^ Marchand, Andrew; Matthews, Wallace. Question 4: Will Jeter Lure 4 Million Fans?. ESPN. March 25, 2014 [March 26, 2014]. ^ Perrotto, John. Yankee Stadium Sea of Blue – Empty Seats – at Game Time. USA Today. October 12, 2012 [March 16, 2013]. ^ Shpigel, Ben. Vazquez's Final Pitch in Pinstripes?. The New York Times. October 14, 2010 [April 17, 2014]. ^ Notre Dame Shut Downs Army, Rolls In New Yankee Stadium Debut. University of Notre Dame Official Athletic Site. Associated Press. November 20, 2010 [January 11, 2016]. ^ Tigers Beat Yankees 3-2, Head to ALCS vs Texas. Sports Illustrated. Associated Press. October 6, 2011 [March 16, 2013].